We are now in the “full on” market crash phase which was predicted many weeks in advance. It comes as no surprise to us whatsoever. The purpose of this update is to consider what is likely to happen over the next few days and especially tomorrow, Monday. When a market tips into a crash on a Friday, what typically happens is that the thousands or even millions of investors who believed the mainstream media and didn’t see it coming spend the weekend “stewing” over their investments – and many of them decide to bail out come Monday. Thus we may see a massive down day tomorrow, possibly the worst of the crash phase, and it would not be that surprising to see the Dow Jones Industrials drop by 800 – 1000 points in one day, perhaps even more. Remember that the Dow Jones Industrials “only” dropped 3% on Friday, which is no big deal by the standards of past crashes. 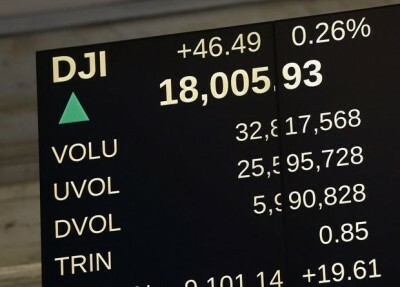 What we need to see before this is over is a headline grabbing day where the market collapse is THE big story, and is not relegated to 2nd place by three fellows tackling a terrorist on a French train, as was the case with BBC World News on Friday – Saturday. It will take something like a 800 – 1000 points down day to achieve this which will probably be the worst crash day, and while we might see one or two more down days immediately afterwards, we would soon be at a high volume selling climax marking exhaustion of the panic phase. Thereafter an erratic rally would probably ensue that would be followed by a more measured decline as the market settles into a bearmarket downtrend. A 2-year chart for the Dow Jones Industrials enables us to see to advantage what is going on. The market plunged on Friday by over 530 points to the black dot above the black arrow, and is obviously in full blown panic mode. The magnitude of the preceding bullmarket and the magnitude of the top area with a huge choppy trading range forming over many months implies that there is more heavy downside to go before the crash phase has exhausted itself. A scenario that looks likely is that the market plunges even harder tomorrow, perhaps as mentioned above by as much as 800 – 100 points tomorrow, before the decline slows on very heavy volume and choppy volatile trading near the support level shown, where it seems likely that a selling climax will occur, followed by a sharp snapback rally. We will be looking to ditch our bear ETFs and Puts in this area. Here we should note that if there is a premature attempt at a rally tomorrow, it would be expected to be followed by renewed decline. Observe how the crash was presaged by a deterioration in the Dow Jones Transports and the Junk Bond market, among other things, for quite some time before it occurred. These are shown at the top and bottom of the chart. What should now happen is that Asia becomes a “sea of red” tonight as the crash rolls around the world in a self-perpetuating “Mexican wave” for a few days, and losses in Asia feed further losses in first Europe and then Canada and the US and Latin American markets later and then back to Asia.